1. Take two pieces of bread and apply butter on one side of each bread. 2. Put the powdered sugar over the butter. 3. Take half the quantity of thinly sliced fruits. Place them on one of the buttered breads. 4. Now, take the third bread piece and apply honey on both the sides. 5. Place this bread over the fruits. Place the remaining fruits above the honey spread bread. 6. Finally, place the third bread piece facing the buttered side down. 1. Combine the finely cut fruits with lemon juice, salt and pepper powder. 2. Place them between bread and cheese pieces. This Sandwich goes to "Healthy Food for Healthy Kids - Healthy Sandwich" guest hosted by Jaleela, an event started by me. wow really delicious..nice fruit treat.. Yumm!!! 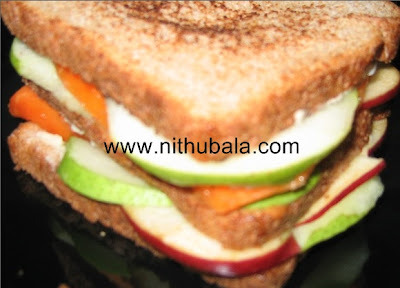 beautiful sandwich...prefect for kids.. Fruits with honey in sandwich sounds great to me. Apt one for kids !!! Very comfort food. I can eat sandwich any time. Love your version, nice and simple. 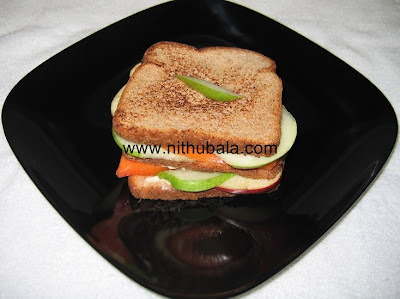 we have it many a times in our b/f nithu..my husband and daughter loves fruit toast sandwhich ..urs looks yummy ..have never tried honey ,i only add chat masala on fruits..
Thats a really yummy fruit sandwich..
Ohh this is great... i never wud have thought of fruits sandwich! Nice idea,I have to try this one! this sound healthy and great! Honey and fruits,who would not want it? wow! lovely sandwich. Love the addition of fruits & would be perfect for kids. Delicious sandwich i would long for.Nice presentation. Thanks dear for a wonderful n new recipe so that I can stir my kids today.